sceptre held in the right hand by Tibetan lamas during religious ceremonies. psychophysical energies in the spiritual life. 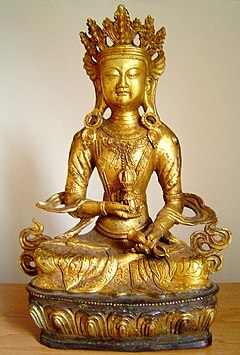 holds the vajra above his right knee in his right hand. this supreme sacrifice sage Dadhichi became a legend. universe, the underlying unity of all things. are perceived by the unenlightened. From the mouths of the makaras come tongues which come together in a point. important correspondence is between the five 'poisons' with the five wisdoms.